Work Process - Tiempo del Corazón. Es ist Herz-Zeit. The goal of all seminars and workshop is that each participant can make a transcending experience which allows him more and more to tap into his personal mastery and to go his path of life in abundance. He will find unexpected and new answers to vital questions and learn to solve own problems. I guide every participant in the group along simple steps through a process in which fears can be released and barriers overcome, in order to find clarity where he wants to go in life. Each person marks out himself what shall be reached and then measures his advance. I place great value on the moment, a full presence and clear awareness. It was said, that “I could see into the hearts of people." The process techniques used follow mainly the transpersonal psychology and millenarian shamanic rituals of our planet (e.g. 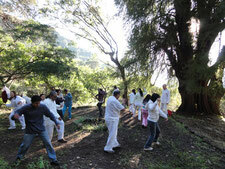 body positions until now kept secret, emotional and mental exercises, meditations and ceremonies). Through Art Coaching we awaken dormant senses, the inner potential of creativity and the multiple intelligences, to get innovative perspectives of any situation as new artists and actors of life. "Pascal K'in Greub’s Lazarus-medicine is more practical than theoretical and is based on the process of each participant towards his very own power and thus freedom. The way there he designs with a lot of practical exercises for body and soul, which trigger profound and lasting changes. I could witness this intensively during four years with lots of participants and with myself. It is not the single technique, but Pascal’s dedication and the present moment that determine the success of a transformation. 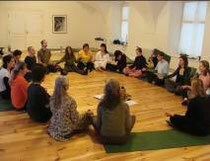 His method combines physical exercises, energy-work, humor and be-a-child, listening circle (counceling) and creativity. No workshop or individual session is like another, one can only live it. And afterwards plenty things will bef different: Through the own change one attracts things into his life and makes success possible, of which you did not even dare to dream before." Dr. Leo Almanza, Medical Doctor, Cuernavaca, Mexico.